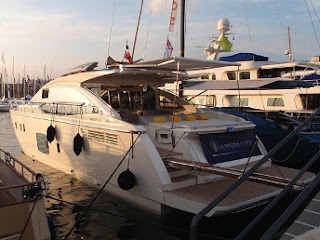 Absolute was present at Palma International Boat Show thanks to its cooperation with the dealer Amo Yachts. The event was especially appreciated by the foreign audience with a strong distinct from Germany and northern Europe that was large since the early days of the show. This is an important rate of a found interest, even if gradual, despite the difficult times for the nautical market. Amo Yachts has provided a strong support to all the old and new ship-owners loving the brand synonymous with quality and refinement in the nautical market. At the show, the just launched Absolute 64 Sport Yacht was exhibited in its beautiful white hull version. It has hit the mark on the public thanks to its style, inner sides and its build quality, giving great satisfaction to the shipyard. The Absolute Wave continues to bring news in the nautical market. Paolo Vitelli has selected Venice, the most magical city in the Mediterranean, to present his two latest jewels of the sea, Azimut 45 and Atlantis 44, enriching the already extensive range of boats offered by the Group. Moored in front of the Hotel Excelsior Lido, the two yachts were the final surprise during an 18th century Venice themed evening: Masks, costumes, Venetian Republic Heralds and the Rondò Veneziano Chamber Orchestra provided the perfect atmosphere for the triumphant appearance of the new arrivals which are soon to become leaders in their class. Swift Trawlers met up at the port of Marseille on Thursday 2nd June to take part in this first gathering organized by Beneteau. All the models of the Swift Trawler range were there, since it was launched in 2003, with 3 Swift Trawler 34s, 2 Swift Trawler 42s, 2 Swift Trawler 52s and 2 Swift Trawler 44s, the latest in the range. More than 40 people cruised on board these splendid travelling boats. On the agenda, the fleet was to moor in the magnificent Calanques, and then to be welcomed to the wonderful Cassis harbour, with a return sail by the Islands of Frioul, on Saturday 4 June. This gathering was co-organized by the C.N.T.L, Cercle Nautique et Touristique du Lacydon (Lacydon Tourist and Sailing Society), located in the old port of Marseille.The very active support of the C.N.T.L made it possible to organize a safe friendly event, which strongly contributed to the success of this gathering. The undisputed success of this meeting between sea lovers and motorboat enthusiasts has already inspired us to prepare a second gathering in 2012! To mark the national holiday celebrating the “Festa della Repubblica” (Republic Day), the Benetti shipyards at Livorno and Lusben (a division of the Azimut-Benetti group specialising in refit & repair work) are paying homage to the city, the Italian Republic and the Italian people by opening the doors of their production sites to all enthusiasts, curious passers-by and visitors who, for the very first time, will be able to visit the production area – measuring over 160 thousand square metres – owned by Benetti, which has been an ambassador of Italian nautical excellence and style for over 130 years. From the early hours of the morning on Thursday 2nd June, it will actually be possible to enter the historical shipyard and visit the production area by completing each leg of the carefully organised guided tour. The day’s schedule of events will begin at 09.00 with the official “door opening” and ribbon cutting ceremony, attended by various authorities and the local press. Welcome addresses will be given by Dr. Paolo Vitelli, Engineer Vincenzo Poerio, Dr. Paolo Casani and Dr. Gianni Cucco. In recognition of the strong and meaningful ties between Benetti and the city of Livorno, the sea and navigation, the ribbon will be cut by the truly exceptional Silvia Testa, a descendent of the Orlando family which used to own the homonymous shipyard (now the production area in which the modern Benetti shipyards are situated) and Daniela Benetti, a direct descendent of the Benetti family. The opening ceremony will also include the reading of a message from one of Livorno’s most illustrious citizens: President Ciampi, who, during his time in office as President of the Republic, was one of the leading supporters for the reconversion of the area into a first-class nautical centre. After the authorities and the shipyard have given their welcome addresses, visitors will be permitted to begin the six-leg tour inside the area. The tour begins with a fascinating route amongst the Benetti-produced yachts kept inside the Benetti Gallery – the most complete collection of Benetti and Orlando scale models – dating from the mid-nineteenth century up to today. It then continues with a visit to the Morosini wharf, a historic dock area constructed in 1911, and then leads into the large assembly and furnishing sheds where the skills acquired in modern yacht construction are now applied: welding, sanding, priming, puttying, installing systems, furnishing and painting. Next, it is on to the service areas and the new Morosini wharf, where the equipment and systems for launching and hauling yachts are fitted. The image of a tri-colour wake in the open sea, chosen as the symbol of this event, will lead visitors, enthusiasts and curious passers-by into the heart of Benetti and Lusben. This is truly a unique event, something which has never been done before and which was particularly important to Azimut-Benetti in its quest to emphasise the mutual benefits of the link between Benetti and the city. Sir Richard Branson, dynamic founder of Virgin Atlantic Airways, lives life on the cutting edge. It was no surprise then, that he would commemorate the 25th Anniversary of Virgin Atlantic Airways London-Miami route with a "splash" landing with Miami's own Cigarette Racing Team. After landing at Miami International Airport with an entourage of British media and guests, on Wednesday, June 15, the group was treated to a nostalgic South Florida experience on Thursday, June 16 a re-enactment of a Miami Vice scene. Branson, playing Sonny Crockett, overtook an adversary in a Cigarette, "arrested" him, but "he" turned out to be a gorgeous "her" -- Karolina Kurkova, supermodel and actress. The promotional event was held on the Biscayne Bay waterfront of the Mondrian Hotel on Miami's South Beach and was entertaining spectacle for all the guests who will watch from the hotel's sea wall. A press conference followed. Virgin Atlantic is celebrating the Anniversary with special Miami-London fares and will be hosting some invitation-only charity and social events while in South Florida. Virgin Atlantic currently flies to 32 destinations worldwide. The airline carried 6 millions passengers last year and has 39 long-haul aircraft in its fleet. The Ferretti Group, a world leader in the sphere of designing, building and marketing motor-yachts that encompasses a unique portfolio of the most prestigious brands in the nautical world, has reinforced its leading position and strengthened its investment in the Brazilian market with the inauguration of the new Ferrettigroup Brasil production facility located on the outskirts of São Paulo. Established towards the end of 2010, the new facility is among the largest of its kind in Latin America and features a total surface area of around 145,000m², of which 45,000m² is enclosed. When producing at full capacity, the shipyard has the capability to build up to 120 yachts per year from the entire Ferretti Group range. It is dedicated to producing yachts that measure up to 83’ feet and are exclusively tailored to the demands of the Brazilian clientele. Currently, the plant can build 11 Ferretti Yachts models, 2 Pershing models and 1 Bertram yacht. The facility has over 600 employees dedicated to production, each of whom share an in-depth technical knowledge of the nautical sector with over 20 years of experience working with the prestigious Ferretti Group organization. A specialised team of artisans diligently work on every detail of the yachts, from laminating the hull to furniture design, assembly and layout. These skilled craftsmen help create each yacht into a true work of art for its owner to have an unforgettable experience onboard. Moreover, the entire line of production features an incredibly high level of efficiency and highly technologically advanced production process. Ferrettigroup Brasil was founded in April 2010, following a joint venture between Ferretti Group and partner Marcio Latorre Christiansen, who has a long-standing history with the Ferretti Group. Spanning a period of twenty years, the working relationship between the two has helped lead the Ferretti Group in becoming a major reference point for Brazil’s nautical market. Today, Ferrettigroup Brasil is the centre for building, marketing and providing after-sales assistance for all of the Group’s yachts in the Brazilian market and is the key contributing factor to the company’s expansion in Brazil. Today’s opening of the Ferrettigroup Brasil facility marks another step taken by the Group over the past few years to improve upon its current positive performance within the region. The exceptional response of the Brazilian clientele during the last boat show in Rio de Janeiro, which took place April 27th through May 3rd, 2011, is clearly demonstrated by registration of total sales of over 35 million Euros for boats produced in Brazil. Moreover, the Ferretti 720, Ferretti 620 and Aquariva vessels, all produced in Italy, were sold immediately after the boat show. Furthermore, negotiations are currently in progress for a significant number of notable yachts including a CRN 43m and three units of the new Custom Line 100’. Today’s event follows the opening of the new, prestigious ‘Tools & Toys’ showroom, which was launched in October 2010. This dedicated 1000m² retail space is located inside the exclusive ‘Shopping Center Cidade Jardim’ luxury mall in São Paulo and also serves to provide a rich programme of events organized throughout Brazil for the Group’s current and potential clients. Present at today’s ceremony was Giancarlo Galeone, Ferretti Group CEO, alongside Lamberto Tacoli, Ferretti Group Chief Sales & Marketing Officer, Marcio Latorre Christiansen, Ferrettigroup Brasil CEO, and the local authorities including Marco Marsili, Consul General of Italy in São Paulo, Giovanni Sacchi, ICE Director in São Paulo, and Roberto Rocah, Mayor of Vargem Grande Paulista (São Paulo)who were on hand to help commemorate the highly anticipated event. All of whom took the opportunity to celebrate the first few months of the successful operation of the facility as well as pay reverence to the Group’s enhanced presence in the Brazilian market. A weekend of festivities and an extraordinary nautical celebration featuring the best Italian-made nautical products in the world. Ferretti Custom Line displayed a wide range of its maxiyachts in the magnificent setting of Piazza Unità d’Italia, measuring 26 to 38 metres, amongst which three new models presented as world premières: Custom Line 124’, Custom Line 100’ and Navetta 33 Crescendo. A special and indeed unique event, if one considers that each Ferretti Custom Line yacht is custom-built for her owner, and that it is rare to be able to admire them together, in the same city, moored at the same wharf. The event had a special parterre too, with clients and dealers from all over the world. The entire fleet was moored at the wharf in front of Piazza Unità d’Italia, a perfect scenario for testifying Italian nautical excellence throughout the world. The event featured a number of prestigious partners, too, such as Maybach-Mercedes, present with an exclusive Maybach 57 s and three models of the “star” (an S 63 AMG, an S 65 AMG and a CLS 63 AMG); Ruinart, official champagne for the cocktail; Baraka gifts; and lastly, the Fendi Casa and outdoor collections, for the furnishings both at the wharf and on board the yachts. At the end of the press conference, Ferretti Group Chairman and Founder, Norberto Ferretti was awarded the RINA plate by Ugo Salerno, CEO at RINA (the oldest classification and certification company organisation in Italy), testifying the certificate received for new yacht Navetta 33 Crescendo. ISA Refit Division was quite busy in the last months. Several works were already completed or are due to be delivered in the coming weeks. One important project is now in the final phase: the engine refit of M/Y SEA D. The port side engine of this 38 meter Proteksan yacht was put ashore through an opening cut into the hull and it was sent to MTU for a complete overhaul. Now the engine is back in place and the ISA refit team is working on the hull repair. Very soon the yacht will be back in the water with a new Flag Blue Awlgrip paint. ISA Refit Division manages also the new Ank's Marina, which is located just in front of the yard in Ancona, Italy. Now that the Summer season is approaching, the activity of the marina is picking up. Many yachts are coming to ISA's docks for a quick pit stop or for a longer stay. All the yachts coming to Ank's Marina can benefit of the assistance of JLT Yacht Agency which will provide a full range of dedicated concierge services. Last week, 15 Jarrett Bay-built boats fished the Big Rock Blue Marlin Tournament and quite a few of those went straight to the Hatteras Marlin Club Invitational. Day 1 of HMC saw stormy conditions and much of the fleet opted to take a lay day. The 70' Jarrett Bay, Ravaganza is currently on the board there with two white marlin releases after day 3. There are also Jarrett Bay boats participating in the Emerald Coast Blue Marlin Classic and Carolina Billfish Classic, both of which are starting right now and fishing into the weekend. The 55' Jarrett Bay Builders Choice was in the yard last month for a complete mezzanine retrofit and other upgrades prior to tournament season. Mezzanine cockpit refits are becoming a popular project on sportfish boats that were built with a conventional standing room only cockpit layout. The basic process is to remove or cut-down old cabinetry and ice boxes for the addition of a mezzanine level and seating. This upgrade often provides just as much (or more) space for coolers or freezers below the sofas and steps, and in this case, even allowed for a larger engine room entrance. All without requiring any changes to the salon door placement. During this refit, the service department performed a number of other improvements. Australia’s premier luxury boat builder, Maritimo, has launched a “Platinum Select” prestige boat sales program. Maritimo Marketing Director Luke Durman said the company was offering a special incentive package for a number of dealer demonstration models throughout Australia. He said the demonstrators include C60 and C47 Sports Cabriolets, a 440 Offshore Convertible with Volvo Penta IPS propulsion and joystick control as well as 500 and 550 Offshore Convertibles. Buyers are urged to contact their local Maritimo Dealer for a detailed specification on the Platinum Select boats. Organised by Gold Coast Maritimo Dealer Ormonde Britton and his team, the dinner brought together about 50 owners for an informal chat about boating. Vince and Colomba Guifre who own a Maritimo M52 and have taken it to the northern tip of Australia as well as exploring the Gold Coast waterways. Vince and Colomba have already registered for the Maritimo Muster from the Gold Coast to the Whitsundays in September. For Kevin and Jan Evans, the dinner celebration was their first chance to meet and talk with other owners in a non-boating environment. Outer Reef Yachts Europe Limited are delighted to announce that they have appointed Ken Freivokh as their exclusive European designer for layout and semi-custom interiors for their range of semi displacement trawler-style yachts. Outer Reef Yachts are enowned for their exceptional sea-keeping and all-weather cruising abilities. Outer Reef Yachts recognise since entering the EU market three years ago that many clients want to semi-customise the interior of their new-build Outer Reef with a more European style and finish. Ken Freivokh design was a natural choice for Outer Reef Yachts to appoint . Ken Freivokh is recognised as one of the most sought after yacht designers of our era with the design of interiors for yachts such as the “Maltese Falcon” to his name. Ken Freivokh has earned a reputation for impeccable design and innovative use of natural materials. A Ken Freivokh design is something rather special; offering a feeling of a super-yacht with timeless quality and style. Overmarine Group new strategy continues to grow through a selection of exclusive partners in the main target markets. After last February agreement with the successful American boating player, Marine Max, with 60 different sales points and listed on the New York Stock Exchange, Overmarine announced last week in Istanbul at the prestigious Hotel Les Ottomans on the Bosphorus, during a press conference with the Turkish economic and financial media, the new agreement with La Mar Aqua, company founded in Turkey for the promotion of the Mangusta brand. La Mar Aqua shares with Overmarine the same values and the same approach to the client offering a full service assistance, in the yacht selling, during the production process and after yacht delivery. Two locations: Istanbul and Bodrum for the offices of La Mar Aqua. The Bodrum premises will also be active in the assistance for all Mangusta owners, in the refitting as well as services like berths, marinas, etc. The agreement with La Mar Aqua represents the first step of Overmarine in the process of investing in Turkey that will amplified by events, boat shows and communication activities focused on the Turkish clientele. Queensland Boating industry have joined forces to establish a unique, not-for-profit boating experience – The Gold Coast Marine Expo, Australia’s first working boat show. The Expo will be held over three days at the Gold Coast Marine Precinct in Coomera where boating enthusiasts from all over Australia and overseas will have the chance to experience a boat show like no other. Many of Queensland’s finest and most reputable boating companies will showcase their craft, marine products or services alongside many international brands at the inaugural event. The Gold Coast Marine Expo has been dubbed Australia’s working boat show because not only will boating enthusiasts see the finished product on display, they will also have the chance to view the construction process through factory tours of some of the nation’s leading pleasure craft manufacturers. Gold Coast Marine Expo spokesman Stephen Milne said it was encouraging to see the marine industry coming together as one for this event. The family event will be held on November 4, 5 and 6. There will be hundreds of new and brokerage boats both power and sail of all different sizes from Kayaks to Super Yachts on display within the marine precinct both on land and on the marinas on the Coomera River. There will also be a wooden boat festival within the Expo, international food stalls with a range of cuisine and a VIP invitation only event on the Saturday night. A fleet of 12 Rivieras travelled in convoy some 156 nautical miles from Adelaide to Port Lincoln for R Marine South Australia’s annual Port Lincoln Experience. About 60 Riviera owners met for dinner and drinks at the Port Lincoln hotel on day one of the Experience, which gave everyone the chance to meet one another before setting out for Reevesby Island the following day. R Marine South Australia’s service manager Dee Bueti said travelling in convoy was a great way to give Riviera owners the opportunity to test their boats in the ocean. R Marine South Australia will host another cruising experience later in the year and will inform all South Australian Riviera owners of the details when they come to hand. Riviera, Australia’s most awarded pleasure boat builder has continued to expand its dealer network with the appointment of Riviera Brisbane in Cleveland, Queensland. The family owned and operated business will officially open early next month. Riviera Brisbane’s joint dealer principals Rod and Ben Crawley have had more than 45 years combined sales and marketing experience and have had multiple Rivieras, having owned seven Rivieras since 1990 including two 34s, a 38, 48-01, 43, 47, 51 and a 56. Rod’s wife Julie and their son Ben have more than 42 years combined sales and marketing experience. Rod said Raby Bay Harbour in Cleveland was an ideal location for Riviera Brisbane because it was a large boating community and was only a 30 minute drive south of Brisbane CBD. Sanlorenzo keeps on a galloping production thanks to its consolidated international clientele of owners that all along prefers strictly tailor made motor yachts. During just a week from the Viareggio boatyard of Sanlorenzo were launched three flagships that represent the highest expression of the Sanlorenzo range with the presence of their Russian owners: Rêve d’Or (46 meters), Scorpion (40 meters) e Santa Anna (38 meters). The first one that has been launched is Scorpion, sixth unit of the blessed series of Sanlorenzo 40 Alloy that received a bunch of international awards (ShowBoats Award 2008 – “Best New Series”, World Superyacht Award 2009 – “Best Motor Yacht” and “Best Exterior Styling”), designed by Francesco Paszkowski and ordered by a Russian owner. Second into the water Santa Anna, fourth unit of Sanlorenzo SD122, flagship of the semi displacement GRP fleet, winner of the World Superyacht Award 2010 – “Best semi displacement or planing motor yacht in the 30m to 39m size range”, also designed by Francesco Paszkowski and ordered by a Russian owner. Finally went into the water Rêve d’Or, third unit of Sanlorenzo 46 Steel, the flagship of all the Sanlorenzo fleet, also for a Russian owner. She is a semi displacement super yacht with a bulbous steel hull and aluminium superstructure. She features unique characteristics in her category, as the Beach Club obtained by folding the transom to water level or the under lower deck, a fifth deck that hosts many a technical device, very easy to inspect and maintain. Her gross tonnage is contained in 499 tons, to remain below the demanding Solas rules for an easier and simplified management. Sanlorenzo, the prestigious Italian Shipyard focused on the production of motor yachts exclusively tailormade according to the requirements and style of every single owner, launched in the same day a SL104, of the Sanlorenzo fibreglass planning fleet projected and produced in the Ameglia Division (La Spezia), and a SD92, GRP navettas of 27 meters with semi displacement hull (SD line) projected and produced in the Viareggio Division. The SL104 – Triple Fun, with her 31.7 meters length and 7,10 meters beam, represents the fourth hull delivered by Sanlorenzo from the debut of this new model (September 2009) until today. The SD92 – Genie 2, with her 27 meters length and 7,15 meters beam, represents the fifteenth SD92 hull delivered by Sanlorenzo from the debut of this new model (September 2007) until today. An unmistakable style and a refined design place the Sanlorenzo yachts to the highest level of the international production, where the Italian Shipyard, in more than 50 years of history, became the synonymous of excellence in terms of quality and attention to details, typical features of the craftsmanship production. After leaving the shipyard, Sunreef Yachts' latest launching, the 70 Sunreef Power Damrak II, sailed off for a cruise alongside the coast of Sweden and Norway before its' voyage to Spain, where it will be presented during a special Sunreef Yachts private event in prestigious Puerto Banus near Marbella. Here the latest Sunreef Power 70 discovered and explored the gem of the Nordic coast and its thousands of Islands. Sunseeker International is delighted to announce the appointment of SNO Yachts as our new Italian distributor. SNO Yachts, with headquarters in Sardinia, are now the exclusive distributor for Italy, fully supporting clients from nine offices throughout the region. Their detailed local knowledge coupled with fantastic service facilities and infrastructure ensures that the SNO team are perfectly placed to assist, advise and support all Sunseeker clients in the area. SNO also have the advantage of being the appointed service agents in Italy for MAN, CAT, VOLVO, Kohler, Twin Disc, Furuno and many other well known marine brands. A press conference introducing the new distributor agreement between Sunseeker International and SNO Yachts of Italy took place on the 16th June 2011, and was held at the Belvedere Hotel Regina Baglioni Via Veneto in Rome. Founder Robert Braithwaite, Commercial Director Jonathan Macklin and Sales Director Sean Robertson from Sunseeker International were all cordially welcomed by the President and the CEO of SNO YACHTS, respectively Andrea and Francesco Pirro. Robert Braithwaite commented that having seen SNO's facilities himself, he shared Jonathan Macklin's enthusiasm for this strong new partnership, and welcomed SNO to the Sunseeker family. Sunseeker Malta is gaining maximum publicity with their latest marketing campaign, which can be found at the Arrival Lounge within Malta International Airport. More than 3 million travellers arriving in Malta will now be introduced to the Sunseeker experience. The contract, which includes an array of advertising spaces throughout the arrival lounge, has been secured for a 7 year period. The advert covers various aspects of the business; including the new range, brokerage and charters. This investment guarantees Sunseeker Malta's exposure, aimed specifically towards their target audience. This move follows the recent investment that Sunseeker Malta undertook, with the relocation of their offices to the luxurious Portomaso Marina. Tecnomar attended the Beirut Boat Show 2011, which took place from May 18 to 22, with the MY Talal (Nadara 45-metre), the largest yacht on display at La Marina – Dbaye. Founded in 1987, Tecnomar has launched over 270 yachts and established itself as one of the top Italian maxi-yacht builders. Since his arrival in January 2009, the new President Giovanni Costantino implemented and completed a massive reorganization and restructuring plan preserving however its history and founding values. Today, in its production plant located in Massa, Tuscany (Italy), the company produces custom made luxury yachts fully personalized according to the Owner’s tastes and requirements.